Dress for Success on Skies and Snowboard. Part of the thrill of skiing and snowboarding is enjoying the refreshing winter weather. By dressing properly, you’ll stay comfortable warm. • Dress in layers. A number of lighter layers allow you to adjust your clothing as the temperature changes. • Wear a base layer of long underwear or tights. Synthetic or wool is best. Avoid cotton if at all possible. • A warm collared shirt, turtleneck, sweater or fleece. • Snow or ski pants are ideal. • A jacket or shell with a high collar, once again water and wind resistant is best. • Ski socks. A few pairs of synthetic or wool socks is best. Fresh socks each day are great! • Eye protection. Either sunglasses or goggles. 100% UVA and UVB. • Gloves or mittens. Gloves allow more freedom of movement, but mittens are warmer because your fingers can share the heat – either way waterproof is best. • Sunscreen and lip balm. Even on cloudy days it is very easy to get too much sun when on the snow. We want everyone to love skiing like we do, that’s why we have created our LEARN TO SKI PACKAGE to provide great value for beginner skiers. The Siegi Tours ski packages include everything you need for your holiday – all in one price! Best Price Guarantee. We have the perfect location for every passionate winter sport fan! 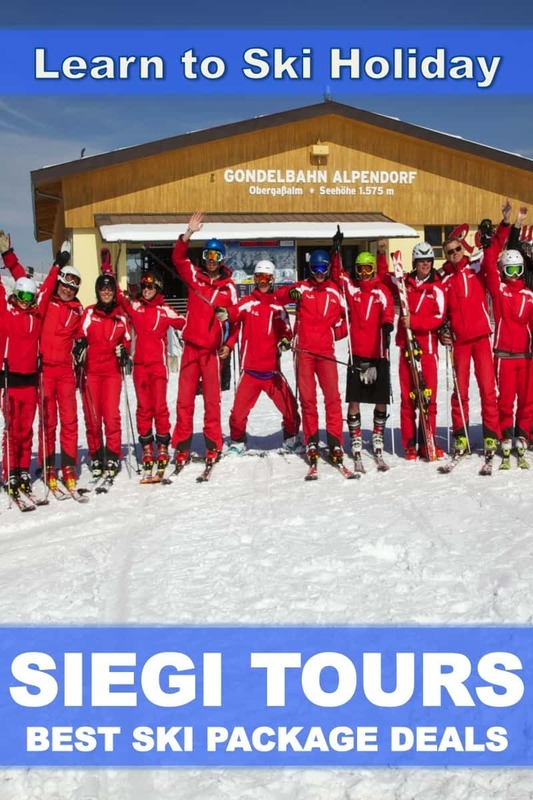 Our Siegi Tours Ski & Board School Red-White-Red offering a big range of excellent instruction / guiding for the novice skier / boarder up to the experts with fine tuning, deep snow and off piste challenges. Enjoy a great day of skiing or snowboarding in Salzburg. Do it all with Siegi Tours Learn to Ski Holidays Salzburg!